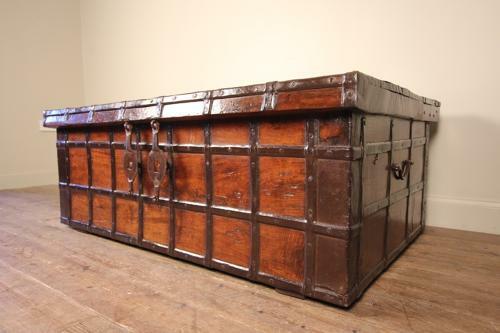 A mid 19th Century solid Teak & Iron banded trunk full of character, Indian in origin and typical of the Rajasthan furniture of this period. Retaining the original side carrying handles, hinges, engraved leaf shaped hasps. Wonderful condition, colour and patina throughout. Perfect coffee table height offering lots of storage.